It’s hard not to lionize Joel Spitzer. Suzanne Crawford of Evanston calls him an angel. Lynn Seinfeld of Skokie says she’s not a religious person, but that she believes Spitzer has a special gift. Crawford and Seinfeld both credit Spitzer with helping them do what once seemed impossible: quit smoking. But Spitzer, a smoking cessation expert who’s led thousands of people through seminars and clinics over the last 33 years, said all he does is help people understand that nicotine is a powerful addiction, and that smokers have to treat quitting as they would any other drug addiction. “His whole thing is you can’t ever have another puff,” Crawford said. “I know that now. I’m addicted to nicotine and I can’t ever take it again. I admit it. “Thank you, Joel,” she added. As the dangers of smoking, from lung disease to heart trouble to cancer, become more widely-known, more smokers are quitting. The Centers for Disease Control and Prevention reported that between 1993 and 2000, the number of adult smokers fell from 25 percent to 23 percent in the U.S., and according to a 2000 National Health Interview survey, 70 percent of adult smokers in the United States wanted to quit. However, as anyone who has ever tried to quit knows, quitting is very difficult. Only 4.7 percent of those who tried to quit smoking in 1999-2000 managed to abstain from cigarettes for over three months, according to the CDC. Nicotine-replacement therapy products flood the market, the American Lung Association hosts a Freedom from Smoking program online and in local venues, and experts like Spitzer offer courses. But why is quitting so hard? “We’re not dealing with a habit with smoking, we’re dealing with an addiction,” Spitzer said. According to Spitzer, the only successful method to stop smoking is by quitting cold turkey, not by cutting back on cigarettes or using nicotine-replacement products. Ann Rowland, who teaches the ALA’s Freedom From Smoking classes through Lake Forest Hospital, agrees nicotine is a strong addiction in the sense that it is powerfully reinforced. Someone who smokes one pack a day will take up to 200 puffs daily, and those puffs are associated with coffee or driving or other triggers. Crawford, who started smoking in middle school, kept it up for 25 years, although she quit for at least a year three times. Three years ago, Crawford decided to take another stab at quitting, and saw an ad for one of Spitzer’s Stop Smoking Clinics, which are funded by tobacco settlement money and are free to Skokie and Evanston residents. Residents of other communities can attend the clinic for $125. Crawford didn’t put any expectations on herself before walking into the first session. 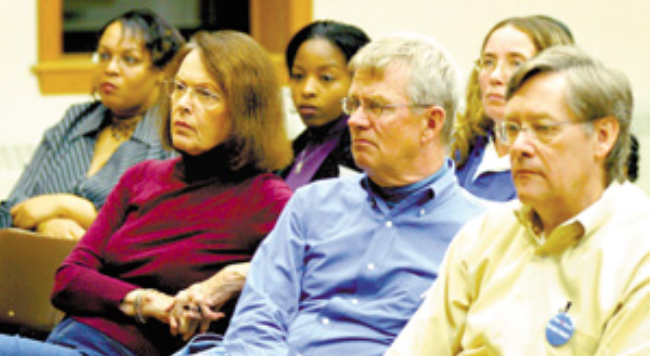 “I could really smell the cigarettes on all the people and then I was struck by this person, Joel, who came in and talked that whole first session about addiction; what and how you chemically and physically deal with addictions,” she said. At the end of the first class, Spitzer, who’s never smoked, told participants they were welcome to leave their cigarettes with him. Before quitting, Crawford had trouble exercising, but she’s since become a fitness professional. Her husband Charles Lehwald has also quit smoking. Spitzer’s motto is “Never Take Another Puff!” a message he drives in during the two-week Stop Smoking clinics, which feature informational sessions and give the participants a chance to talk about the withdrawal process. Spitzer also keeps up with the members by calling them twice a day and providing other support. He just graduated another 20 quitters from his October class. The next clinic starts on November 30. “You deal with enough smokers and you’ll see it’s an addiction,” said Spitzer, who has been speaking about smoking since he was in high school. He started out giving smoking prevention talks for a science fair project in 1971, when he was a freshman. By his senior year, he was lecturing at medical schools and training others about smoking prevention and cessation. From the beginning, Spitzer called smoking an addiction, even before the U.S. Surgeon General did so, and has watched public opinion change as the dangers of smoking became better known. Spitzer disagrees with those who say you can quit by cutting back on cigarettes. He also believes that nicotine-replacement products only increase a potential quitter’s misery. He cited one recent clinic graduate who’d stopped smoking 20 years ago, but who still chewed nicotine gum, and still struggled with nicotine withdrawal symptoms until going through his program. Ann Rowland, program director at Lake Forest Health & Fitness Center, says using nicotine-replacement products is a personal choice. The ALA recommends carefully following the directions. The products are supposed to be for temporary use in order to relieve withdrawal symptoms during the quitting process. “I don’t advocate them, I don’t not advocate them,” she said. “I allow the person to decide what would be best for them. At her Freedom From Smoking clinics, which meet over the course of three weeks, participants spend the first two weeks learning what factors trigger their smoking and plan strategies for restructuring their environment in preparation for quitting the third week. “It helps; so when quit day comes, they can quit cold turkey,” Rowland said. 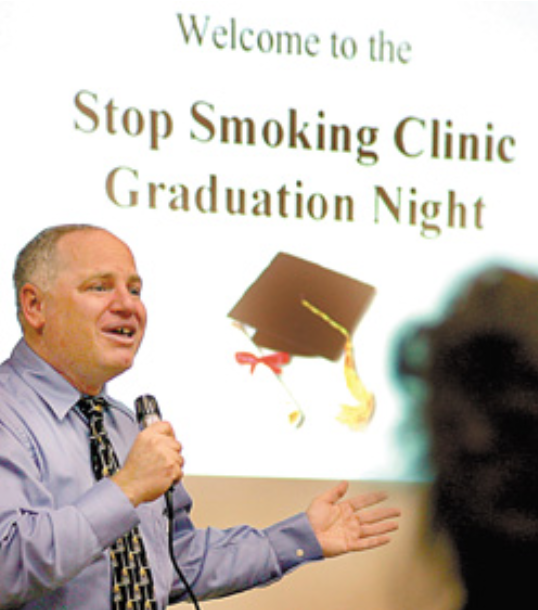 Rowland teaches the Freedom From Smoking classes twice a year at Lake Forest Health & Fitness Center, although the planned fall class at the Lindenhurst facility was canceled due to low enrollment. Lynn Seinfeld smoked for 30 years and never tried to quit until after her father, a smoker, died of an emphysema-related illness. Seinfeld searched carefully for a smoking cessation program, and arranged a special meeting with Joel Spitzer before attending his clinic two years ago. “I remember when she came in to check me out,” Spitzer said with a chuckle. Seinfeld was impressed by Spitzer’s genuine concern for smokers, and by his friendly demeanor. After she quit the first night of the session, she woke up the next morning full of anxiety for her first day without cigarettes. Seinfeld remembers little about the first three days, when her body was going through the physiological withdrawal symptoms, other than that she desperately wanted a cigarette. She did strange things, like one day when she went to Panera and ordered soup in a bread bowl. One of the motivations Spitzer suggested was putting aside the money his students would have normally spent on cigarettes. Since quitting, Seinfeld enjoys dinners with friends that are uninterrupted by cigarette breaks. She’s complimented on her clearer skin and voice, and is able to sing and exercise again. Still, she admits that she keeps a pack of cigarettes in her car, just in case. “If ever, God forbid, I’m in an accident and I’m dying, I want to be able to go with a cigarette in my mouth,” she said. For more information about the American Lung Association Freedom From Smoking program, visit www.lungusa.org. To learn about Joel Spitzer’s Stop Smoking clinics, smoking cessation and prevention seminars, and self-help material, go to www.joelspitzer.com.